AND MAD RIVER GLEN IS SUCH A GREAT HOTEL! Slide Brook Lodge is a wonderful hotel that is close to Sugarbush and Mad River Glen ski resorts in the Mad River Valley. The combination of the comfortable and laid back accomodations, the inexpensive price, and the beautiful tavern are what make Slide Brook such a great hotel. 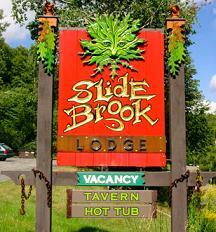 When you are looking for a hotel at Sugarbush, Slide Brook Lodge is the place to stay. Sugarbush base lodge is one mile from the hotel and there are several nearby restaurants such as Pizza Soul, Chez Henri Bistro, and Mutha Stuffa's! Upstairs in the hotel, there are a variety of rooms. There are simple hotel rooms with shared bathrooms, two deluxe hotel rooms with private bathrooms and couches and T.V.s, and finally an efficiency apartment on the top floor of the hotel. As mentioned previously, there are two living rooms in the hotel. The hotel's lobby is one of the living rooms and has a leather couch and chairs and a flat screen television. From the hotel lobby, guests may climb a spiral staircase to the hotels official living room. This room has a huge flat screen television, leather couch, etc., and a beautiful half circle window that looks out over the deck and down German Flats road toward Sugarbush Access Road. When guests want to relax or hang out, they usually go to one of the hotel living rooms and lounge around. In the hotel's living rooms and in the hotel's Tavern, guests will meet eachother, discuss the day, and find out information about the snow conditions, etc.